LOCATED IN THE HEART of the Douro Valley, Abadía Retuerta LeDomaine is today a winery, vineyard and hotel housed in a former 12th-century monastery. Among the estate’s many gems is the culinary team behind the one Michelin-starred Refectorio, under the direction of Chef Marc Segarra. The Michelin star was obtained within three years of the restaurant’s opening. 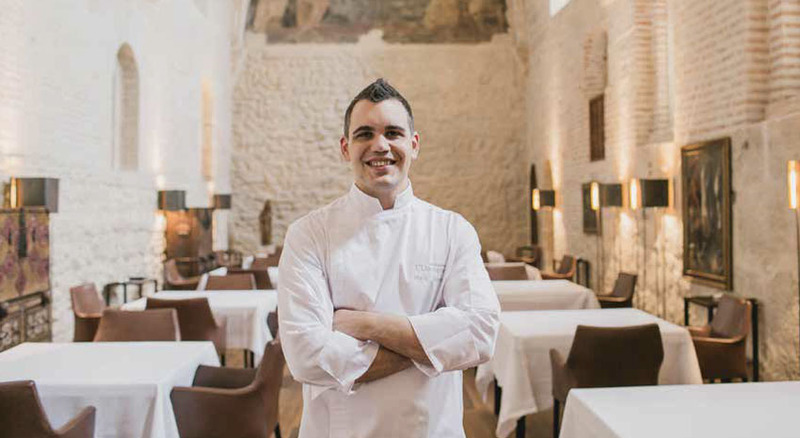 Segarra perfected his skills while training in some of the world’s most internationally renowned restaurants. In an area flush with agricultural riches, from the wines to the produce, Segarra’s creative vision incorporates tradition and local ingredients, offering two tasting menus at dinner service which vary according to the products of each season. Wines of the estate complement the cuisine. Guests of Abadía Retuerta LeDomaine can also enjoy the on-site Vinoteca, serving traditional tapas cuisine, and the seasonal Jardín del Claustro, also serving the fresh tastes of the season. Aside from wine, the estate is known for crafted Spanish foods including wine salt, pine nuts and honey products. I don’t have any specific destination in mind; however, I love the seaside. During my childhood, I used to enjoy the sea, as it was near my home. Moreover, the Mediterranean diet is healthy. My menus reflect the balance of being close to nature using lasting techniques. Ferran Adrià is undoubtedly the example to follow, as he has a wide imagination and knows how to transform it into reality. WHAT ONE PERSON MOST INFLUENCED YOUR COOKING STYLE, AND HOW? Several chefs have influenced me, including Santi Santamaria, Josean Martínez Alija, Andoni Luis Aduriz, Rodrigo de la Calle and Paco Morales, with whom I have had the privilege of working. I’m inclined to prefer Thai food; however, I realize this is a big world and there are still many places to be discovered. As far as future trends are concerned, I feel we have to go back to health food. The times of raw fish and meats have passed, so have many others. I concentrate on using seasonal products, and in each season, a plate will be created.